Blog Editor’s Note: Military exercises are a necessity, including those that jam GPS. This year’s Red Flag exercise starts today and ends on February 16th. GPS jamming will be part of the exercise, but will undoubtedly not occur the entire period. That said, any jamming is likely to make aviation in the area more costly by requiring aircraft to fall back on navigating by VOR and DME, and interfering with ADS-B tracking and collision avoidance. The Reason Foundation has recently suggested that a backup system for GPS such as eLoran could save the FAA money in the long run. It would also allow users to avoid more expensive and time consuming routing during GPS disruptions. Military training exercises may cause delays and necessitate reroutes. Beginning tomorrow, January 26, and running through February 18, GPS-equipped aircraft operating in the Western United States should be prepared for possible satellite signal disruptions at various altitudes. The disruptions may lead to traffic delays and even ground stops. 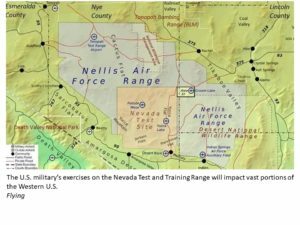 The NBAA Command Center reports the U.S. military will begin training exercises on the Nevada Test and Training Range between 0400Z until 0700Z daily. Training maneuvers will impact vast portions of the Western U.S. including California, Nevada, Oregon, Wyoming, Arizona, Utah, Colorado, Montana and New Mexico. FAA enroute ATC centers affected include Albuquerque (ZAB), Denver (ZDV), Los Angeles (ZLA), Salt Lake (ZLC), Oakland (ZOA) and Seattle (ZSE). Operations in R-2508 and R-2501 may also be impacted. Arrivals and departures from airports within the Las Vegas area may be issued non-Rnav re-routes with the possibility of increased traffic disruption near LAS requiring airborne re-routes to the south and east of the affected area. Aircraft operating in Los Angeles (ZLA) center airspace may experience navigational disruption, including suspension of Descend-via and Climb-via procedures. Non-Rnav SIDs and STARs may be issued within ZLA airspace in the event of increased navigational disruption. Crews should expect the possibility of airborne mile-in-trail and departure mile-in-trail traffic management initiatives. Arrival and departure delays could exceed 30 minutes during peak demands during initial implementation and peak traffic periods, especially Thursday, Friday and Sunday nights. These delays could lead to the implementation of ground stops, ground delay programs or even airspace flow programs. Operators should monitor the FAA OIS page for current major initiatives.